Ecuador’s natural resources have both fueled reductions in inequality and obscured the need for deeper transformation. 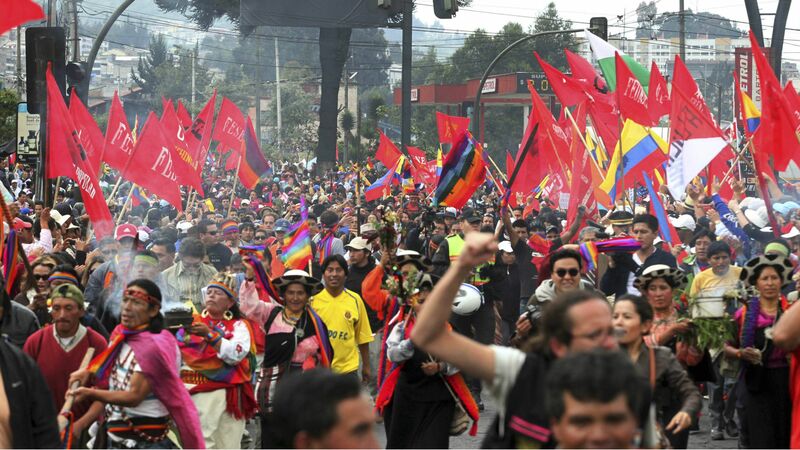 A 2014 march to Quito to protest against the El Mirador copper mining project. Although Lenin Moreno managed to win his election campaign, his left party and the party of former president Rafael Correa, Alianza Pais (AP), no longer enjoys a legislative supermajority and has lost several important elections at the municipal and provincial levels. There are three key features of the current Ecuadorian predicament: the tense relationship between social movements and the state; the persistent challenge of left party-building, and the double-edged sword of commodity dependency. Each of the features helps explain the Left’s position — and why it has been unable to move towards the promise of twenty-first century socialism. The first feature is the polarized relationship between social movements and the leftist government. Across the continent, with the Pink Tide and the Left in power, there is a wide variety of relationships between leftist elected governments on the one hand, and social movements and popular organizations that have long struggled against neoliberalism and imperialism on the other. Once the Left was elected, the question of how to actually relate to those movements that brought the Left to power became pivotal. In Ecuador, this relationship has been incredibly polarized — probably the most divisive in the region. Groups like the national indigenous federation, the CONAIE, which for decades had resisted neoliberal policies and also struggled to decolonize and democratize the state, early on declared themselves early to be in opposition to Correa’s government. Along with other groups, they’ve been protesting Correa’s policies ever since. At issue for the indigenous federation and allied campesino and environmental groups is the extractive model of development, which they believe the government is entrenching. It predates the Correa administration, but they see the Correa administration as reproducing it. This model of development, which relies on the rapacious extraction of natural resources, entails environmental destruction and the fragmentation of indigenous territory. These are the key points of contention between movements and the state. In response, Correa and his ministers have rightfully pointed out that increased oil and (soon) mining revenues have allowed the state to increase social spending and to reduce poverty. But the Correa administration has also unnecessarily polarized the conflict, arresting hundreds of indigenous and campesino activists for what have been, by all accounts, peaceful protests against oil and mining policies. This came to a head in December through February, when the government declared a state of emergency in the province of Morona Santiago in the Amazon, where there has been significant, violent mining-related conflict, using military and police forces to forcefully displace and dispossess Shuar indigenous people whose territory overlaps with mining projects. Activists have grown increasingly militant, and the state response has become more and more violent. Such actions have bred extreme distrust and polarization between movements and the state. Meanwhile, these indigenous, campesino, and environmental movements have been unable to mobilize a mass popular movement of the size, scale, or political capacity of the anti-neoliberal uprisings of the 1990s and 2000s. The problem is this: on the one hand, the government lacks movement support. But on the other, movements have been unable to mount a viable left alternative to Alianza Pais. The second factor is the challenge of left party-building. The lack of a political party suited to the task of confronting oligarchic forces has undermined the Left’s political power — not just the existing oligarchy, but the inevitable deployment of oligarchic power that is always going to come about whenever you try to transition away from capitalism. Such a party would function as a vehicle for popular mobilization and cadre and leadership formation. It would be democratically controlled by its members, with popular organizations afforded a decision-making role, and would develop programmatic unity through popular assemblies and conventions. Alianza Pais lacks all of these features. Instead, it was created as electoral vehicle during Correa’s first presidential campaign to get him elected to office. It has no democratic mechanism for choosing candidates, is run by very small cadre of leadership, and has no accountability to popular organizations. In addition, AP has made a number of questionable local alliances that have further diluted the coherence of the party’s program. As a result, AP reproduces its own centralized leadership rather than serving as a political force to forge popular unity. A mobilized, militant, and politically-organized left grounded in popular-sector organizations is the only way to fight the conservative backlash. But intra-left disputes over resource extraction and indigenous rights have made this task impossible in Ecuador in the absence of a viable left party. Despite Moreno’s presidential victory, the weakness of the Left’s institutional structure does not bode well for its electoral future — or, more fundamentally, for the possibility of a transition towards socialism. Third is the issue of commodity dependency and how it has proved a double-edged sword for the Left in power, in Ecuador and elsewhere in Latin America. Leftist governments — in South America, especially — have governed during a global commodity boom, which started in 2000 and lasted until about 2011. While historically-high prices of oil, minerals, soy, and other commodities have provided leftist governments with the fiscal room to maneuver and actually govern, in the longer term this primary-export model of accumulation is an obstacle to achieving twenty-first-century socialism. Leftist governments have channeled revenues from the extraction and export of primary commodities into social spending and infrastructure investment, leading to huge reductions in poverty, as well as reductions in income inequality and great strides in terms of health and education outcomes, access to clean water — all sorts of developmental outcomes that we care about. In political terms, this is also very important. The Left, once elected, was actually able to follow through on campaign promises. It’s one thing to be elected and say “we’re going to pay off social debt”; it’s another to then find yourself governing in a time of austerity and be unable to do anything but administer that austerity. That was the fate of left governments that came to power in the 1980s and early 1990s — they had no room to maneuver fiscally. It’s quite another thing to actually have the resources at your disposal to make good on those promises. This has made a huge difference, and is one of the reasons why the Left has been able to win as many electoral victories as it has, in multiple countries. But the other side of this prosperity, the other edge of this sword, is that left governments’ reliance on this model of accumulation has re-entrenched ruling class power. In addition, for the Left in power, it is the very availability of these resources to address social needs that obscures the need for a deeper transformation in class relations. Revenues from oil and mining can fund social and welfare spending without any major redistribution of property — you don’t have to take things away from wealthy people if you have money coming in from extractive activities. This has resulted in what I call a “hydrocarbon-fueled social-democratic bargain.” The income of the poor has increased without expropriating the wealth of the rich. This is very much the case in Ecuador, where the amount of redistribution of actual assets of the wealthy has been minimal to none. What this means is that the income of the poor has increased with little outright expropriation. There is still very persistent inequality in land ownership, for example. If you go to the countryside — and, aside from its oil resources, Ecuador is an agricultural economy in many ways — land tenure and peasants’ access to water is terrible, and land ownership remains very unequal. In addition, because of the way oil revenues have circulated in the economy, you actually have the increasing concentration of capital in several sectors. These three features — the tense relationship between social movements and the state, the challenge of left party-building, and the ambivalent realities of commodity dependency — are intimately related. The transition away from the extractive model of accumulation (and from capitalism itself), and its replacement with the popular and solidarity economy that the government has promised, would require the building of militant popular organizations that are allied with but autonomous from the state. Thus, in Ecuador, the persistence of ruling-class power is enabled by the weakness of the popular sectors. Editor’s note: Our most recent issue, “By Taking Power,” covered the rise and fall of the Pink Tide in Latin America. At the 2017 Left Forum in New York City, Jacobin and NACLA cohosted a panel discussion on the state of the Left in the region. We will be publishing transcripts of the talks given at the panel in the coming week.